Inside the agreement signing to develop Private Rooms at the Raa Atoll Regional Hospital on 10 July 2018. An agreement has been signed to develop six private rooms at the Raa Atoll Regional Hospital in Ungoofaaru. 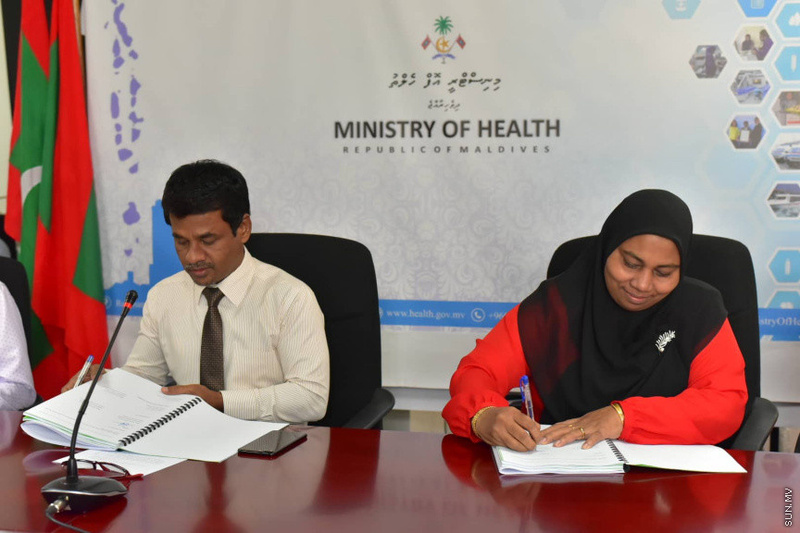 The project agreement was signed at a small ceremony held at the Health Ministry today by the Health Minster, Abdulla Nazim, and the Managing Director of Aman Maldives PLC, Murushidha Ali-Manik. Speaking at the ceremony, Minister Nazim said that the project is targeted to give better service to patients who gets admitted for treatment at the Raa Atoll Regional Hospital. The Health Minister said that in the past four and a half years, President Yameen has made a lot of effort to improve the health services in the atolls. The MP for Ungoofaaru constituency, Jaufaru Dhaud, also took part in the ceremony saying that the atoll has about 15 resorts and many tourists come to the hospital as well. And so the service of private rooms at the hospital is very important. For the six new private rooms, a nursing station, clean utility and dirty utility medical store, general storage and a treatment room will be developed in the project. The project worth MVR 4,002,486 is contracted to be completed in 180 days.